As people age, daily routines and tasks can become increasingly difficult. 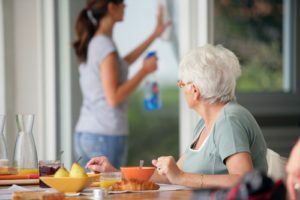 Many people need general assistance with self-care and home maintenance in their later years, and there is no need for them to have to move in order to receive it. Florida First Senior Home Care refers to professional caregivers who can assist them with senior care services like accomplishing any variety of daily living tasks and to meet their physical, mental, and emotional needs. This is by no means a comprehensive list of services a referred caregiver can provide. Essentially, caregivers can provide assistance with any daily tasks or routines your loved one may need help completing, all in the comfort of their own home rather than in an institution. The caregivers we refer are highly compassionate and qualified professionals who prioritize their clients’ freedom, comfort, and independence. If you want to give your loved one the joy and dignity of aging in their own beloved home and still ensure that they have access to regular assistance and professional care, call Florida First Senior Home Care at 561-771-5980 today.